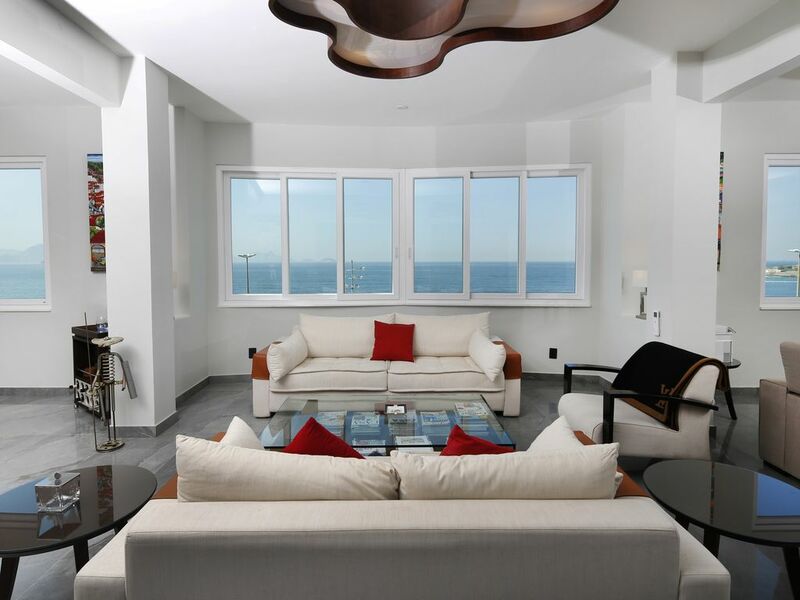 2500 square feet, 3 bedrooms, 3 bathrooms, triple living room, facing the beach in Copacabana with a stunning view of the ocean. One apartment per floor. 2 elevators. 6th floor. Completely redone, new kitchen, new bathrooms, very efficient Air Conditioning units all over. Very modern look. TV in each bedroom and the living room, with more than 100 channels, including HBO and Max. Apple TV and Netflix. Sonos sound system all over. WiFi Internet covers the entire apartment. A Dell computer is available at a desk with a printer/copier/scanner. Safe deposit boxes in each bedroom to lock away valuables. Doorman in the building 24/7. Car park available for free. Housekeeper all day included during the week (outside of legal holidays in Brazil). Very quiet building on the beach. Restaurants, supermarkets, banks are all nearby. Short walk to a subway station (General Osorio) that goes directly to the center of the city in 15 minutes. Several bus stops within 50 feet of the apartment. A roof terrace on top of the building available for guests, with deck chairs. A french man living between Paris, Bangkok and Rio de Janeiro. There are many expatriates living in this neighborhood, the south zone (Zona Sul in Portuguese), where the best apartments are located. I chose to live in Arpoador, which is the part where Copacabana meets Ipanema. This allows my guest to go from one area to the other in a few minutes. I just bought this new apartment of 2,500.00 square feet and rebuilt it, with all the modern amenities, hard to find in Brazil, like silent air conditioning, sound proof windows, modern baths etc. Very exclusive location: nothing between the beach, the ocean and the apartment windows! An apartment of 2,500.00 sqf with 3 bedrooms, 3 bathrooms, a maid service every day during the week, a very efficient air conditioning and a comfort quite rare in Rio. A very quiet building with only one apartment per floor and even a garage underneath, for a rented car or when friends come to visit. Metro and buses are nearby, with taxis available day and night. New apartment, large (2,500.00sqf), each room has a King size bed and its own bathroom, facing the ocean and the beach, in the best location in Rio: Copacabana. Daily maid's service helps to create the perfect vacation. Copacabana beach facing the apartment, Ipanema beach is a 5 minutes' walk. Copacabana is a unique combination of a city life with a beach resort. All the facilities of a city, restaurants, shops, bars etc. and also a beach life are here. Copacabana beach in front of the apartment. No neighbors to block the view to the ocean. We provide a cell phone for use when in Rio; receiving calls is free. Hi end Japanese air conditioning, very silent and very efficient, all over the apartment. Linens are provided, and changed regularly by the maid. A fully enclosed garage is available for free on the first floor of the building. Bathrooms are provided with towels, floor mats, soaps and shampoos. Large round table for 6 people. 60 inches TV in the living room, plus a TV in every bedroom. Also access to Netflix and Apple TV with 500 movies. The apartment is all on one floor with no steps to the bathrooms. The penthouse was beautiful and clean. The owner and his staff were very organized and I would love to use them again back in Rio in this new year. Beautiful condo in great location with fantastic views. Great location with beautiful views of Sugar Loaf mountain. Can't get any closer to Copacabana beach. Condo is newly remodeled and is very well outfitted. Our group was 4 adults and we had a bedroom to spare. The cleaning person was very accommodating and did an excellent job. The owner helped us locate a local trustworthy tour guide that was excellent. We were provided a local cell phone to carry if we wanted too. This is a top notch location and I will be suggesting to anyone of my friends that plans to visit Rio. Thanks to the owner for helping making this a trip to remember. Apartamento excelentemente hubicado sobre la rambla de Copacabana, todos los detalles excelente gusto en todo su interior, no te falta nada, equipamiento de cocina muy bueno, todo el apartamento con sistema de audio de muy buen nivel, todos los dormitorios con muy buena comodidad de camas y excelentes baños..
Beautiful view of Copacabana beach, the most modern and complete amenities, a housekeeper for all dates except weekends - possibly the best VRBO or Airbnb type place we have ever visited , and we have been to dozens. Some of our group of 5 adults were apprehensive before the trip because of all the publicity about crime in Rio, but we never felt unsafe and never had a problem. We did use a guide to visit all of the usual tourist sites. If we return to Rio, the first thing we will check is if this location is available. Very friendly neighborhood: Copacabana is a beach town in the middle of a gigantic city. You will find right at home in this "South Zone" of Rio de Janeiro, full of restaurants, bars and, of course, several miles of beaches. The apartment is in Copacabana but very close to Ipanema, which can be reached on foot in 10 minutes max. There is a subway station nearby that brings passengers to downtown and Barra de Tijuca.